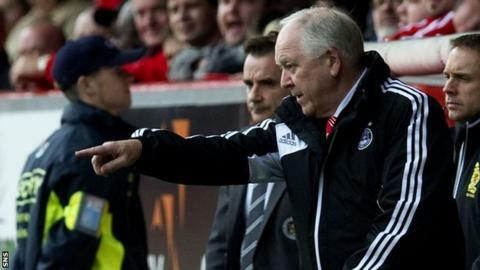 Craig Brown defended the release of striker Michael Paton despite his Aberdeen side's failure to score for a third home match running. "When a guy wants to play rather than sit on the bench, it's not fair to keep him," Brown said of the 23-year-old who was released on Friday. "Michael was never a prolific scorer. The decision was taken as much for him. "I said he was not going to be first choice even with Rory Fallon and Niall McGinn injured." Brown said Paton's departure will also give him a chance to develop further the talents of teenagers like Cammy Smith, Ryan Fraser and Jordan Brown. Striker Smith struck the underside of the bar with a header shortly after coming on as a substitute in the 0-0 draw with St Mirren. "For a 17-year-old, that could have been a dream home debut," said Brown. "But it will come - he will score goals for us." Brown was not panicking about the lack of home victories and praised his side's determination against the Buddies. "I cannot complain about anything other than the finishing," he added. "The three home games have been very similar. "Even without four key players out injured, we were dominant in the game. If we continue to play like that, I can't complain. "I am content in that it is a good Aberdeen team that will compete well in this Scottish Premier League. "You saw the rejoicing on the St Mirren bench and that is compliment to our team."